If the service could identify who you were it was also possible for it to garner a much wider spread of data about you within the context of you being a student or a teacher at the College. Most significantly, once the service has context there are endless opportunities for the service to develop traits that are exhibited by a digital assistant. These traits also enable the service to acquire and apply its knowledge to support students and teachers across multiple domains within the wider campus. This article explores the importance of context and how it can be leveraged to build an engaging digital assistant for an education campus. If a campus digital assistant is to behave with context it needs to be aware of what has bought the student to this current place and time, what is currently happening and what is planned. It also needs to be aware of where the student is within the student life cycle. Situational context with regard to time and place is important because it enables the digital assistant to be behave in a manner that delivers a truly personalised experience to the student. It enables students to ask: what grade do I need to achieve on my next assignment if I am to maintain my grade average, am I on schedule to achieve the entry grades for my next course or what courses can you recommend to me? Let's examine what is needed to satisfy the first of these questions. The team that supports the development of the digital assistant will need to make the service aware of all the grades that have been secured by the student, the target grade set by the student and the number of assignments that are still to be completed. The service will also need to be made aware of what information, advice and guidance it needs to present to the student if he or she is performing below the target grade; and what actions it needs to take to inform the academic and support teams that look after the student with his or her studies. Situational context is also very broad. For example, the digital assistant may remind teachers about the students who have an overdue assignment or the students who need to secure a particular grade on their next piece of work to improve their grade average. In other contexts the digital assistant will support teachers during a course team meeting as it responds to a broad range of questions regarding the academic progress being made by all the students on their course. The digital assistant will advise students about revision workshops prior to an upcoming exam or to events that are associated with their university applications. The service will also advise students about the options and pathways that open up as they advance with their studies. In this instance, the digital assistant operates at scale, as it offers tailoured information, advice and guidance to every student on the campus. If the digital assistant is aware of time and place it can start to adapt its tone to reflect what it has observed about the student. For instance, what tone should the digital assistant use if a student is not securing the grades to achieve a place at his or her desired university or what tone should be used when the digital assistant informs a student about a good grade on a recent piece of coursework? In the first example, the digital assistant could advise the student to discuss the matter with a course tutor or with the team that is overseeing the student's application to university. The tone is supportive and it encourages the student to seek advice and guidance. In the second example, the digital assistant is in a position to praise the student. In either case, the tone should reflect the ethos and culture of the campus. There will be occasions when the digital assistant will act on behalf of the campus to stretch and challenge a student so that the student aspires to higher grades on his or her course. On other occasions, it may nudge students to complete late pieces of work. Tone should also be seen as a facet of the digital assistant's personality. Institutions need to show a degree of judgement here. Is the digital assistant going to be a friend, a critical friend, an adviser, a mentor, a teacher, a coach, all of these or non of these? Please note that personality traits will become increasingly important, especiallly when our digital assistants become our life-long companions. A campus digital assistant should be seen as a composite of multiple services or agents that perform specialist functions to support the needs of students, teachers and support teams. For example, one of the services or agents could be tasked with providing timely information, advice and guidance to support students progress onto further study, training or employment. Another service could be tasked with providing timely prompts and guidance to students as they submit their coursework. Elsewhere, services could undertake automatic marking, they could identify students at risk, they could offer resources to support students with their coursework and others could help students with day-to-day enquiries around the campus. The digital assistant will use the knowledge that is gathered from all these services and use it to support each of the students across the campus. Please note that information will also flow back to each of these services or agents which will subsequently alter their engagement with each respective student. When this happens the digital assistant and its underlying services will behave with increasing levels of context. How does context present itself through a digital assistant? The service logs Tom's details and the natural language processing capabilities of the service makes it aware that tonight's Duty Principal information is required. Within a second, the digital assistant presents the information to Tom. There are numerous instances where context can be demonstrated by a digital assistant within an education campus. In the following example, the digital assistant responds to a question from a student called Tom about tonight's Duty Principal. If Tom decides to message the Duty Principal, the Duty Principal will receive Tom's details along with the message. Tom can also offer feedback to the College regarding the answer to his question. Without context, a simple question about tonight's Duty Principal could not be addressed. Here are other questions, queries or tasks where context needs to be applied by the digital assistant. As you can see, context is everywhere. What grade do I need to achieve on my next assignment if I am going to achieve the grade average to secure a place at my chosen university? Which of my students are performing below par with their studies? Which of my students are out on work placement next week? The delivery of a tailoured daily report card to each student and teacher on the campus. The marking and feedback of long form work that is submitted by students. The compiling and distribution of personalised online teaching, learning and assessment materials through an institution's learning management system. I would like to attend university. Can you advise? Overtime, a single campus digital assistant will be in a position to address these questions and tasks and more besides. When a student asks about applying for a university course, the digital assistant will be aware of the student's historical record, current and predicted grade profiles, how the student is currently performing across his or her programme of study and the student's place on the student life cycle before offering information, advice and guidance to that student. The assistant will respond within a second or two; and it can do this time and time again and at scale for all other students who attend the school or college. The governance arrangements around the use of digital assistants on an educational campus will need to address ethics. Campus leaders, the developers who are designing digital assistants; and the students and staff who are using these services will need to address multiple matters around the design, use and governance of digital assistants on the campus. The emergence of the digital assistant within the education sector is throwing up multiple questions and concerns that all require attention. These include privacy, data security, algorithmic authority, agency, transparency, accountability and more. Students are likely to feel comfortable about their digital assistant offering information, advice and guidance that supports their studies. They may also be happy to know that the digital assistant operates within a wider context and that it will inform and work alongside teachers and support teams to support their studies. However, how will students expect the digital assistant to behave if they asked the service about a mental health concern? Will the student consider this to be a private matter or will the student expect the service to relay pertinent information to the institution's safeguarding team? In other matters, when is it appropriate to use historical data to inform the decisions of the digital assistant; and how transparent is the service when it uses such data? Institutions will also need to anticipate that they will be asked to explain the underlying behaviour of their digital assistant; and why the digital assistant came to certain decisions. 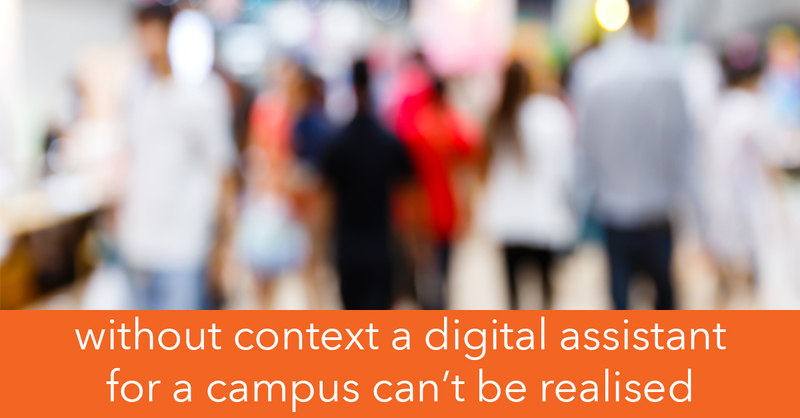 Context is a key aspect for any digital assistant on the campus. Without context these services can't possibly behave in an intelligent or informed manner; and they won't be in a position to support students, teachers and support teams with day-to-day enquiries and routine tasks. Education campuses are complex environments where things are constantly changing; especially the dataset around each student. This means that the knowledge that individuals and teams possess is going to be far from perfect. In fact, it's going to be incomplete, uncertain and imprecise (The Knowledge Illusion, Sloman and Fernbach, page 73, 2017). This is due in part because no single teacher or member of the student support team has access to the entire dataset that surrounds any given student. However, the digital assistant does, and with context it enables students, teachers and support teams to make informed decisions and hopefully better decisions. In a campus setting students, teachers and support teams seek immediacy. They expect information to be delivered to them quickly and they expect to carry out routine tasks and activities with little or no friction. The advent of the campus chatbot enables schools, colleges and universities to meet this need. At a simple level, the campus chatbot can respond to day-to-day enquiries about campus services and it can also respond to enquiries that are specific to the individual who engages with the chatbot. In this instance, a student can ask about the lessons that are taking place this morning, the date for a forthcoming exam or the grade awarded for a recent assignment. A teacher can ask for the list of professional development workshops that he has attended over the last year or about the academic performance for a given student on his course. The ability to garner information in this manner is welcomed. However, as we begin to use chatbots to support individuals across more knowledge domains we soon realise that they need to respond to individuals contextually. Context is important for a variety of reasons. The student who asks about the deadline for a forthcoming assignment needs to know more than just the date and time for submitting the assignment. If the chatbot is aware that the student is seeking to progress on to university after her studies and her grade profile is slightly below target, we should expect the chatbot to advise the student accordingly. In this instance, the chatbot should advise the student about the grade that she needs to secure if she is to maintain her target grade average; or it may advise scheduling a meeting with the course tutor before the submission date. A chatbots ability to assimilate a large volume of information gives it properties that are useful to students, teachers and support teams; especially when it behaves contextually. The service can nudge, prompt and guide individuals as they engage with services on the campus, and it can support, advise and guide individuals as they carry out day-to-day tasks and activities. This is possible because the chatbot asks itself the following questions when supporting a student: what is the student asking, besides giving the answer is there anything else that I need to be aware of, if so what is it, does it apply to this particular context, how should I respond the student, have previous responses resulted in positive outcomes, which response should I offer, what is the student's position on the student life cycle, do I need to inform teachers and support teams about the question and my response to that question and so on. The campus chatbot recognises the question posed by the student, gathers information, garners insight and presents its answer back to the student with ease; and it repeats this for all students on the campus on a daily basis throughout the academic year. At an operational level, a student could have numerous agents acting on her behalf. These agents will have specific roles such as supporting the student to secure her place at university, making sure that she meets her target grade, recommending reading lists or reminding the student about her assignment deadlines. 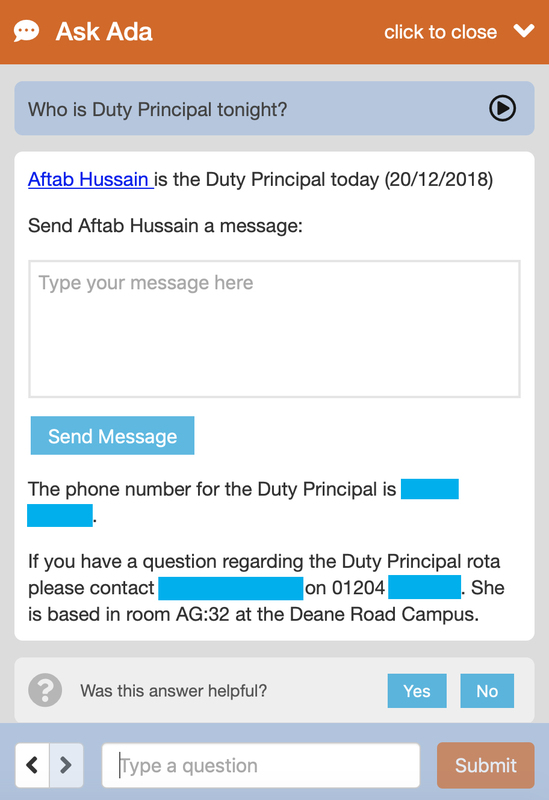 These agents inform the behaviour of the primary chatbot on the campus; even controlling the tone of messages or conversations with the student. When campus chatbots become context aware they are in a better position to help students, teachers and support teams with the myriad of tasks and activities that need to be done on a daily basis in our schools, colleges and universities. I don't expect campus chatbots to be an exact facsimile of a teacher or a member of the student support team; but as these services become more context aware colleagues will increasingly use them to support their workload. Indeed, the success of any campus chatbot is dependent on the support that teachers and other colleagues offer when training the chatbot.